Konica’s Autoreflex T3 descended from their original Autoreflex single lens reflex which had the novel (and probably unique) feature of being able to switch from the full 35mm format to half frame at will mid-roll. Although the T3 does not share this ability, it’s still a solid, well made 35mm SLR that’s worth considering if an example presents itself to you at a keen price. When I spotted one at a local recycling shop a few years ago I felt the asking price was initially a bit steep. A few months later it was still there and the price had been reduced sufficiently for me to take a punt on a brand of SLR I’d not previously tried. Not having owned a Konica reflex camera previously, I have however been an admirer of the brand’s optical prowess for some years, since I purchased an Auto S2 rangefinder. 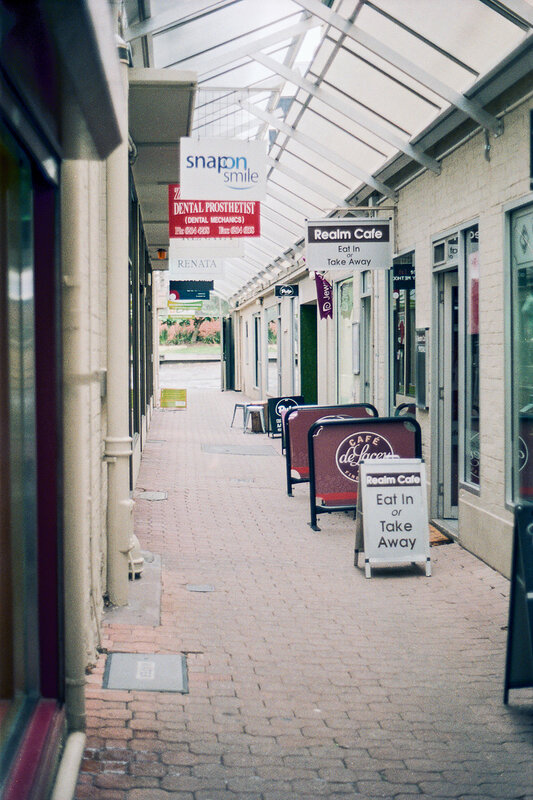 Its 45mm f/1.8 Hexanon lens is one of the sharpest optics I own, so I was keen to see how Konica’s reflex optics compared. This particular T3 was sold to me with a Konica AR Hexar 135mm f/3.5 telephoto in its original lens case, and a Kenlock 2x auto teleconverter with electric eye “ EE” metering compatibility (more about that, later). On arrival my T3 was firing its shutter correctly at all speeds (Bulb to 1/1000). But its 50mm f/1.7 lens wasn’t opening and closing the aperture blades as rapidly as it should. Rectifying this meant attending to some age related problems with both the lens and the stop down mechanism of the camera body. Apart from aperture blades that were contaminated by lubricant residue—quite a common issue with SLR lenses of a certain age—the lens actuating ring of the 50mm Hexanon was in need of some lubrication. This is not always the case, or even desirable (depending on the type of lens). Some types are designed to run dry and oil will create malfunctions. But I was impressed after dismantling the lens for cleaning to discover that the control ring for its aperture blades run in their own ball bearing race (a loose, crowded ball type). Most Japanese types of similar age and type lack this feature. Thorough cleaning of all the relevant parts was not sufficient to get the aperture stopping down properly when held in every orientation. This last point s worth noting because (speaking from experience) you should always check proper aperture function with a lens held in different positions, as occasionally a combination of design features and wear might see the blades work OK with the camera held horizontally, but drag a bit with it pointed upwards or downwards. Even super light aperture blades are not immune from the effects of gravity occasionally. Eventually, the barest trace of oil in the ball races gave perfect operation no matter which way the camera was tilted. The stop down mechanism within the camera lens throat also required careful cleaning, some adjustment for mechanical wear and a trace of light oil, before it would run smoothly. Some time after working on the Konica, I learned that age-related problems with the stop down mechanism are a known problem with the T3, though one that’s reasonably easy for anyone with some basic repair skills to solve. The T3 meter checked out OK with two 1.4 volt zinc air hearing aid batteries installed in lieu of the correct original 1.35 volt specification type. Readings could vary from that of a known, trusted light meter by half a volt at certain light values, but with this noted, the built in CdS cell meter was close enough to call on occasionally with a roll of Kodak Ultramax 400 loaded. With the Konica ready to rock and roll it was finally time to take some photos with it. Following are my observations about that. The T3 is no Olympus OM-1. It may not have the sheer bulk of a Zeiss Contarex but it’s a full sized classic Japanese SLR and in your hand, it feels like it. Personally, I don’t mind that. Most of the time, I prefer to make exposure readings with a hand held meter. As many of my favourite cameras don’t have a built in meter at all, it’s simply how I have long been accustomed to setting my exposures, so I’ll tend to do this even if a particular camera has a decent metering system. So although I’m able to use in camera meters competently if needed, I rarely take advantage of them even if they’re fitted. But the T3 has a metering system that’s versatile enough for me to actually call on it sometimes, and it lends itself to being used by photographers with more than a passing understanding of metering theory and practice. With compatible Konica lenses the T3 features shutter priority auto exposure. This entails setting the lens aperture ring to the green “AE” position that engages a drive connection controlled by the meter. Based on the images I shot with it set to AE, I think you could expect to get good results in most less challenging lighting situations, although, like the majority of its period competition certain scenarios such as back lit portraiture may catch it out. A knowledgeable user can still assure good exposure even then, because the meter has “ lock needle” functionality I rate highly in desirability. It permits you to take a reading from a more suitable light source and then, by gently depressing the release button, hold or “ lock” the reading while you re-compose and shoot your image. In use it’s such an easy and effective way of achieving a good exposure that, were I to use a T3 frequently I would probably utilise it. This is high praise from me since a hand held light meter is almost permanently into my right hand whenever I photograph. The Konica meter may also be used for manual exposure imaging if desired. By setting your preferred lens aperture manually the shutter speed may be adjusted until the correct exposure is set according to the meter reading scale on the right side of the viewfinder. It’s not an "over/under" read out. You line the needle up with the aperture you’ve chosen and fire away, and it functions well enough if you prefer to work this way. As I ran through the roll of Ultramax, (a few images from which are included below), I let the camera fly itself on AE a few times by simply “ pointing and shooting”, took some readings from specific scene locations before locking the meter needle, and even set a few more shots manually. When the roll had been developed and scanned I couldn’t recall, or work out, which shots had been metered which way, because they were all exposed very well. I did notice that the T3 does share one minor feature with the Auto S2 rangefinders. Its film gate has a small “v” notched into its edge (much like the famed pair of Hasselblad “Vees” found in their film magazines gates. The Konica has just a single v near a corner of the film frame on its short edge. This makes it easy to see at a glance if a particular film has been exposed in the T3 (or an S2, as the case may be). I’d not be at all surprised if some other Konica models share this trait, but having only used the S2 and T3 I can’t speak with veracity about that. My T3 has since been sold because quite unexpectedly, I received the chance to purchase a type large format camera I had long desired at a price I couldn’t refuse. So the Konica was one of a few cameras to draw the short straw and get re-homed to balance my bank account. But one thing that made me hesitant to let it go was the viewing experience it offered. Its Fresnel ring is so crisp and snappy, that it’s one of the fastest, and easiest, cameras to manually focus that I’ve ever used. In this respect, it’s definitely one of the most effective SLRs I’ve ever imaged with. It’s also a very well featured camera. That lever situated on front of the body on the wind side serves double duty, because it sets the self timer (when the button in the lever centre is depressed) and also stops down the lens for depth of field preview. Moving to the top deck, a tabbed ring around the shutter control knob will engage the multiple exposure release when needed. A small indicator window behind the shutter dial shows you, at a glance, if the camera is cocked and ready to fire (Green) or is unwound (Red). At the rear, I particularly like the slot for the end of your film box which Konica have included on the back. As someone with a number of cameras loaded at any particular time, it’s a pleasant change not to have to mess about with bits of tape and marker pens to record the type of film loaded. It’s a feature I wish more manufacturers had thought of. Just about the only premium SLR feature not included by Konica is a mechanical mirror lock up. But all’s not lost, because when the self timer is activated, the mirror retracts immediately after the release is depressed, not ten seconds later when the curtains trip. In the intervening period any mirror-induced vibrations have plenty of time to subside, so you’ve got everything you can use to promote maximum mage sharpness if you need it. The timer can be engaged with the shutter speed set to Bulb without damaging the mechanism, too—I made a point of testing this. It might seem like an odd combination to use. With the shutter set to Bulb, most people will after all be using a cable release, anyway. But setting the timer first, enables you to also exploit that mirror pre-release if your exposure is longer than a second on those occasions when you really need to keep vibration to a minimum—for instance, using a long lens in low light conditions, and/or with very slow film loaded. During the roll I ran though the T3, I didn’t notice any ergonomic problems. The camera is jam-packed with features but the basic layout is very conventional. Shutter speeds are to the top right of the pentaprism; a release button sits alongside that; and the wind lock release is down on the lower cover, just where most contemporary cameras have it. If you’ve used nearly any other Japanese camera made over the last fifty years, I can’t see you having too many problems. There’s a great deal to like about the Konica, and very little not to. 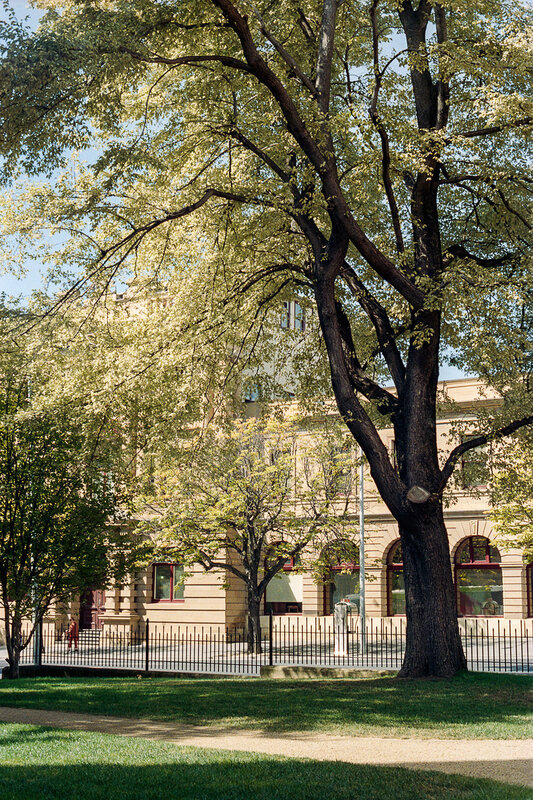 As far as image quality is concerned, I’ve included a few photos from my roll of colour negative for readers to peruse. They were made with the standard 50mm f/1.7 Hexanon lens on Kodak Ultramax 400 colour negative. I'm a photographer who images on 35mm or medium format film. I enjoy using older, all manual cameras from my collection, and I'm also a self taught camera repairer who can never resist just one more German classic (according to my long-suffering wife). We live on a few acres of forest and pasture near Hobart, with our two children, four Border Collies, three cats, alpacas, goats, geese, ducks, peafowl, turkeys and chickens, and Tasmanian native fauna species like echidnas, wallabies, kookaburras, bandicoots, (and many others). You can see more of my work here or via my Facebook page. I also have a blog about my adventures in film and collecting and repairing old cameras.